Adela Geli, architect; Arnau Blancafort, quantity surveyor; Blanca Borràs, architecture student; Roger Soler, quantity surveyor. Town Council of Sarrià de Ter. The building is the work of the famous architect Rafael Masó (1880-1935). The Sarrià de Ter schools are located in the main street of the town. It is a plot of long and narrow proportion between medians, where the building is subdivided into three successive volumes separated by patios. The first of the volumes built (volume A) is ground floor and two floors, the latter removed from the facade to the street. Separated by a first patio, there is another building with a single nave and ground floor (volume B) with a gable roof with slope in the longitudinal direction of the plot. Finally, the posterior building (volume C) is also separated from the second building for a patio of dimensions similar to the first and is also ground floor. It also has a gabled roof. Compositively, the front of the building has an organization around a central axis of symmetry, with three vertical bands, two narrow at the ends and a wide central part. As is proper in the architecture of Masó, the symmetry is not perfect, but it is distorted to the extreme bands. The left and central band present their compositional order, also based on a central axis of symmetry. The later bodies present / display indications that could take to conclude that Masó also could be involved in. These signs are the eaves and the size and arrangement of the openings and carpentry. It seems that there is a dialogue between the front walls of the buildings. However, none of the three buildings presents any decisive decorative element to attribute the authorship to Masó. 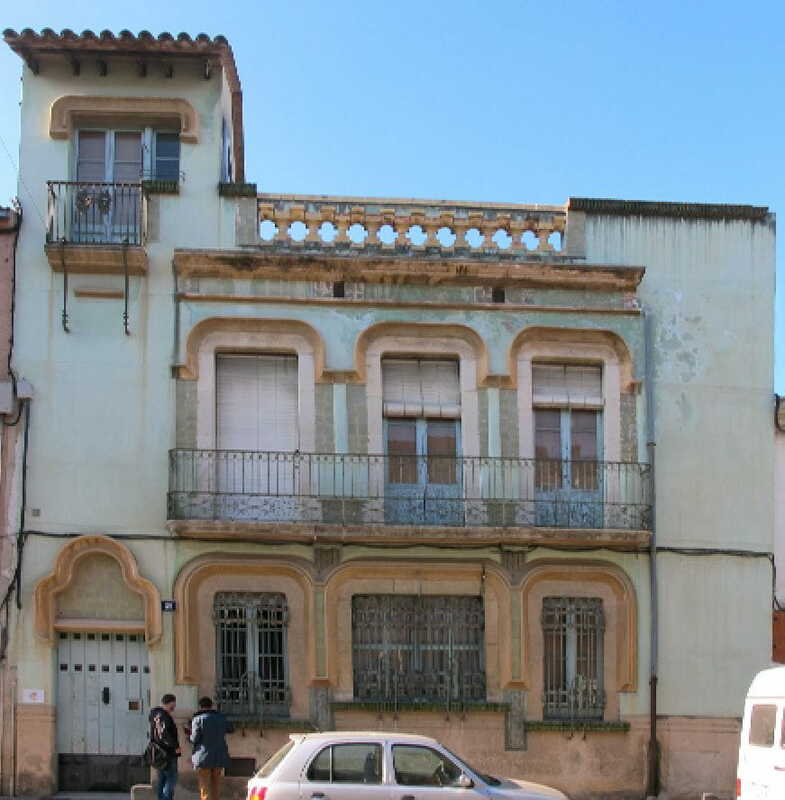 The overall performance in the building of the old schools of Sarriá is inscribed in the Plan of Cultural Facilities of Sarrià de Ter, prepared according to the guidelines of the PECCat of the Generalitat of Catalonia for municipalities of less than 5,000 inhabitants. According to these standards, the new equipment must be a modular building, subject to the needs and possibilities of the municipality and that can be built in phases. It must have basic minimums: an exhibition space, a social space, a multipurpose space and a minimum of 210 m2 in classrooms and workshops. 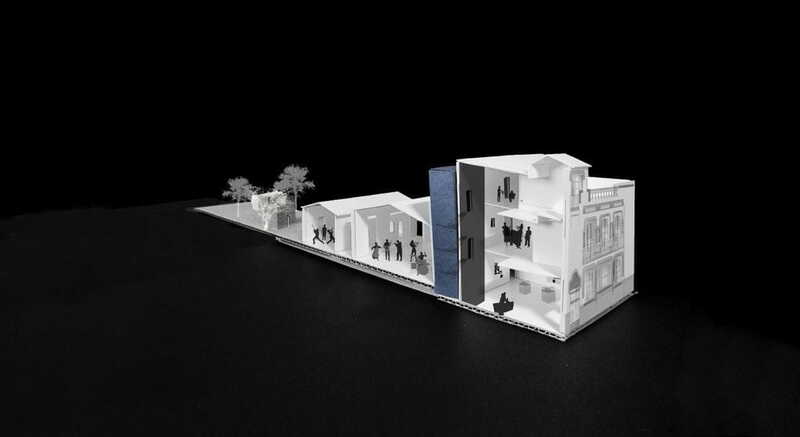 The Cultural Equipment Plan establishes that the center will be structured in two blocks: the Rafael Masó building and the annexed site, where, if necessary, the construction will be extended by the exhibition space and by the permanent collection of sculptures by the local artist Emilia Xargay , currently in the SAM of Girona. 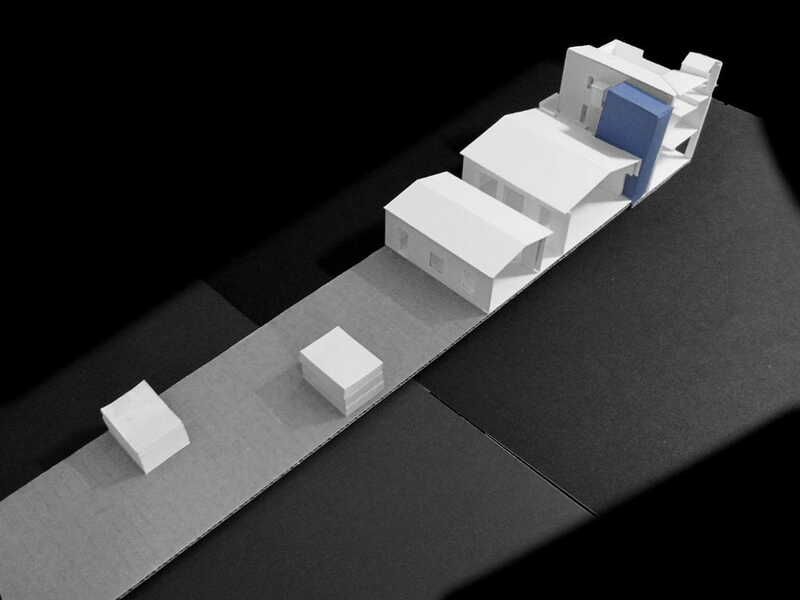 It is proposed to allocate this free space to a possible construction of an exhibition space of small pavilion for the permanent collection of plastic works of the artist Emilia Xargay. The garden space itself would also be part of the exhibition space. It is proposed the reform of the current building for use as independent rehearsal rooms and linked to the service at alternative times in the school itself, with independent access via carrer del Firal. It will be necessary to adapt the building to the level of facilities and provide for safety measures and emergency evacuations. The total area of ​​this volume is 102.55 m2. This open space and new openings will be the auditorium of the school, also thought as a social space of the center that can host public events, presentations and other events. The total area of ​​this volume is 143.90 m2. It is intended for the specific uses of the music school, which are structured on the basis of the different floors of the building. The ground floor will be used to receive more public space, taking advantage of the space under the main vault as a space for temporary exhibitions. 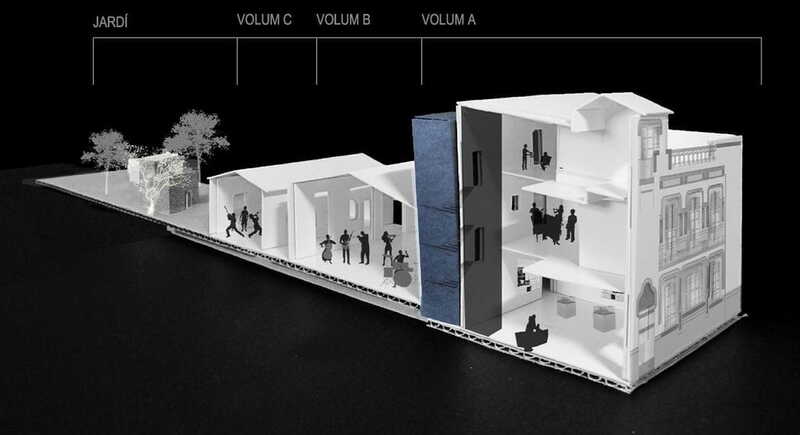 The construction of a new communication nucleus formed by staircase and elevator annexed to the rear façade of the volume is proposed. On the first and second floors it is proposed a refurbishment as music and music language classrooms. The total area of ​​this volume is 396.24 m2.